DoubleLine Funds’ Jeff Gundlach just spoke with CNBC’s Sara Eisen, and in a wide-ranging interview, Gundlach discussed, among other things, Tesla. Gundlach said that Tesla is not about the cars, a view he shared with Bloomberg’s Barry Ritholtz back in July. Tesla CEO Elon Musk is also the chairman of solar energy company Solar City. 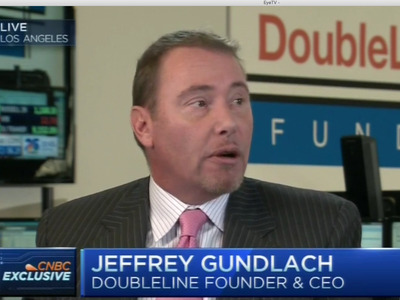 Gundlach said this potential is particularly strong in the “sun states” like Arizona and Nevada. In September, Tesla struck a deal to build its $US5 billion gigafactory in Nevada, where the company plans to build lithium-ion batteries for its electric cars. And while Tesla will be its own battery supplier once the gigafactory goes online, the real benefit that Gundlach thinks the company could reap from this operation is the ability to sell the batteries to other companies. On Monday, Gundlach said Tesla has the ability to be a “major leader,” but again reiterated that his bullish view on the company is about the batteries and the company’s technologies, not its cars. Regarding the stock, Gundlach didn’t take a strong view, as Tesla stock has been perhaps the most volatile and talked about in the market over the last couple of years.